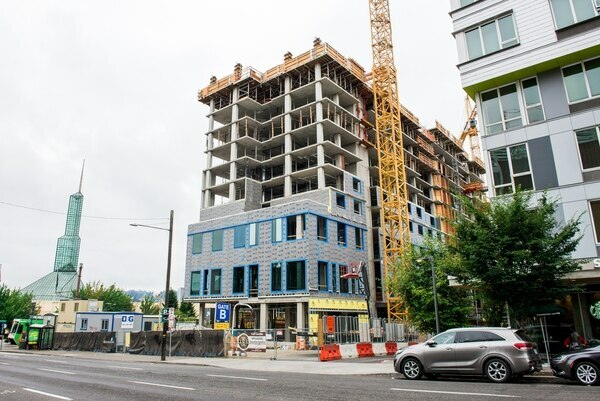 Along the streetcar tracks in Portland's Lloyd District, taxpayers are backing a 14-story dream rising next to the Oregon Convention Center. It's a 600-room Hyatt Regency, built by private developers wrangled by the regional government Metro at a cost of $224 million, including $74 million in public funds. The hotel is expected to open in about a year. For decades, local officials have said Portland needs such a hotel to attract what they say will be highly lucrative national conventions—gatherings of data scientists and dentists who want to stand in line for ice cream cones at Salt & Straw. But by the time the Hyatt opens, Portland may have a glut of hotels. 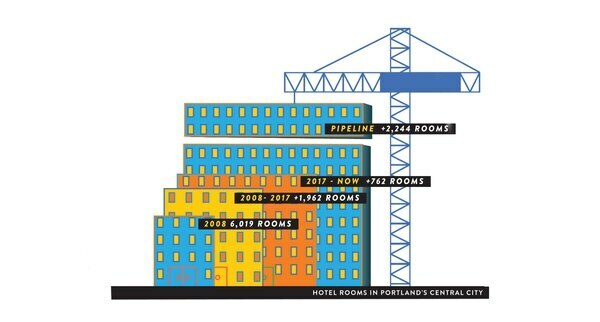 The city is experiencing a hotel-building boom—one that observers worry could leave the Rose City with more rooms than visitors. "It's great for tourists," says economist Joe Cortright. "They'll be discounting like mad." 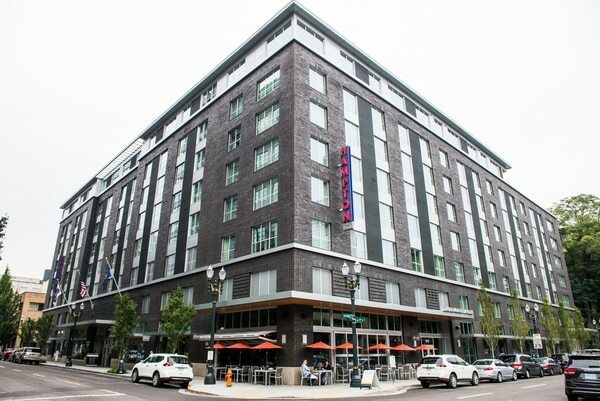 Data from STR Inc., which tracks supply and demand in the hotel industry, show Portland added 762 new hotel rooms in the past year to the 8,000 already in the central city. Seven planned projects, including the Hyatt at the Convention Center, would add another 2,244 rooms. In all, that would mean an increase of nearly 40 percent since July 2017. "The market's ability to absorb what's still coming is in question," says Kasia Russell, a managing director at HVS, a consulting firm that evaluates hotel markets for investors and lenders. "It will be a shock to the system. I would be lying if I said it's all roses." The steep increase in rooms is a testament to the work tourism officials have done to make Portland a destination that entices visitors and hotel investors. But hotels are subject to the same market forces that caused Oregon cannabis prices to plummet and Portland apartment developers to offer two months' free rent to prospective tenants. "Portland has had a good growth spurt over the last couple of years," Cortright says. "But from what I've seen, the market is getting saturated." Why should you care? First, whether Portland succeeds in making itself a perennial visitor destination will determine the ongoing economic health of a city currently enjoying boom times. Second, some of the public money on the table—Metro's—was borrowed. If conventiongoers fail to materialize, as has been the case in other cities with similar projects, taxpayers are on the hook to repay it. "The big question is, how much money will they lose on that hotel?" Cortright said. "How much money Metro has to kick in to keep it afloat is probably a very live issue." "We're pretty excited about the demand that there has been for this product," says Scott Cruickshank, general manager of visitor venues for Metro. He says the hotel is already exceeding its projected bookings. Much of the credit for Portland's hotel rush belongs to the visitor association that has spent the past two decades promoting the city: Travel Portland. But room growth also speaks to the herd mentality of developers, who have simultaneously jumped into the Portland market because it's not as saturated as other cities'—and because it's developed a reputation as a hot spot. "I get calls about the Portland market on a weekly basis," says Russell. "Portland's always been regarded as a distant cousin to Seattle. It's never been looked at as a primary investor market. That's changed." 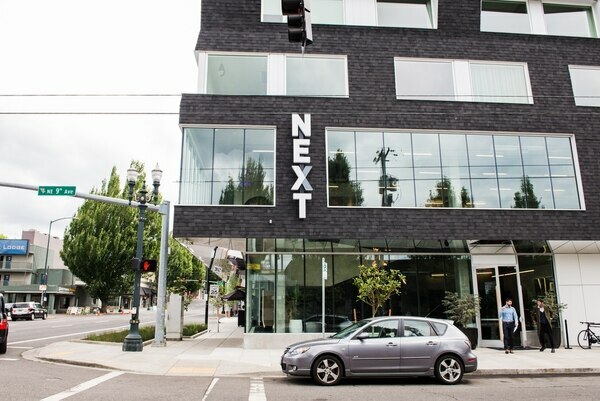 Over the past decade, Portland added 2,724 new rooms to the 6,019 already in the central city. Just one problem: Hotels rely on corporate travel to fill their rooms, and Portland isn't a big business hub. Hoteliers say Nike is responsible for as many as 50,000 room bookings each year. That sounds like a lot—except that three hours north in Seattle, travelers associated with Amazon book as many as 500,000 hotel rooms a year. And Seattle also has Starbucks, Microsoft and Boeing adding to demand. "We don't have a company like Amazon bringing that exponential growth," Russell says of Portland's market. "I don't see us ever growing like that." "I expect to see rates fall initially," says Charles Holt, who manages the Mark Spencer Hotel downtown. "I'm hoping it's not too dramatic, but I think that will be marketwide as hotels get more competitive to maintain business." Others say they aren't worried. "Portland is a fabulously growing market," says Alex Dawes, general manager of Embassy Suites Portland Downtown. "All competition is good competition, because it means the city is thriving." 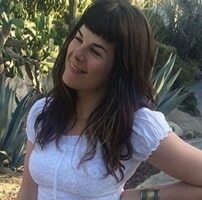 Travel Portland acknowledges room prices are dropping—but a spokesman says that's OK.
"We should be significantly less expensive than any other West Coast destination," says Travel Portland spokesman Marcus Hibdon. "Now we will have the hotels it takes to host larger conventions, and we will have a price point that makes us much more attractive." Privately, local officials are less sunny. In budget documents, city officials warn a crunch in lodging taxes looms. 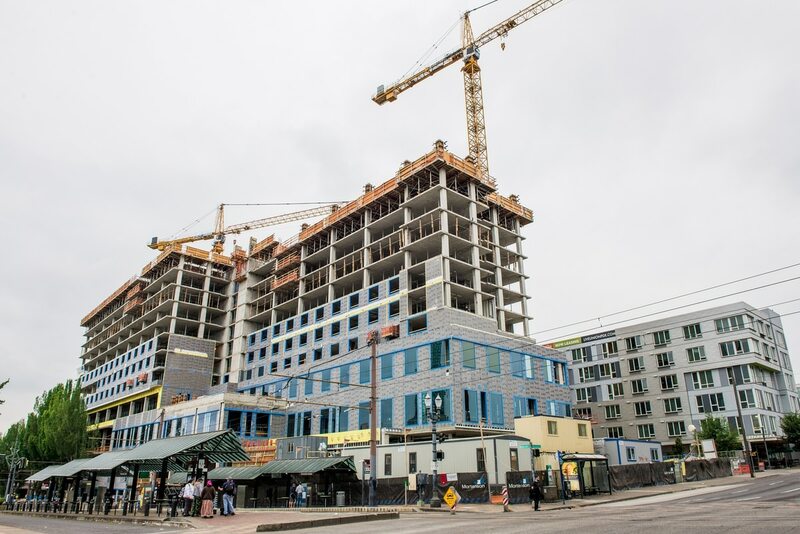 "An economic downturn could result in a dramatic reduction of transient lodging taxes to the city," budget officials wrote in April, "as a greater number of hotel rooms fight over fewer customers." When that downturn comes, the Metro-championed Hyatt, with fewer nearby amenities than westside hotels, will be a prime candidate to lower its rates. But Metro says the Hyatt hotel will generate even more visitors for Portland. "We were very conservative in our projections," says Metro's Cruickshank. "We had 25 conventions booked that represent 129,000 room nights throughout the city that would not have come if that hotel was not coming next door." Clarification: This story originally implied that Metro owns the hotel. It is coordinating the project, which is privately owned. With Fancy New Hotels Come Fancy New Hotel Bars. Here's a Review of the Most Recent Batch.